"Journey to Persia" has a great sound and artistic equality and is sold in the stores frequented by non-Iranians. This makes a great gift to introduce non-Persian to our beautiful music. 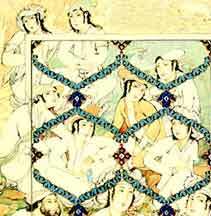 From the introduction to Dastan Ensemble's "Through Eternity: Homage to Molavi (Rumi)" CD: Seven hundred years after his poetry swept the Persian world, Molavi ­ better known in the West as Rumi ­ can still be heard within the lush rhythms and phrasings of Persia's passionate musical tradition. On Through Eternity, Iran's acclaimed Dastan Ensemble [with Shahram Nazeri] bring together an all-star gathering of master musicians in an unprecedented evening of virtuoso vocal and instrumental performances.